Oral arguments before the Supreme Court are scheduled for Wednesday in a case regarding Trump's travel ban. HONOLULU — Before Neal Katyal represented the state of Hawaii in its challenge against President Donald Trump’s travel ban, scheduled for oral arguments before the Supreme Court Wednesday, he was the acting solicitor general of the United States, where in May 2011, he issued a “confession of error” acknowledging the government’s mistakes in the defense of the “forced relocation and internment” of Japanese Americans during World War II. In addition to Katyal, many involved in opposing the current travel ban are inspired by the fight against the anti-Asian laws of the past. The third version of the ban maintains limits on granting visas for travelers from several countries, including Iran, Libya, Somalia, Syria and Yemen. Chad was included in the ban up until this month, when the administration lifted its restrictions on the country. The ban also applies to North Korea and Venezuela, but the lawsuit does not challenge restrictions on those nations. In December, the Supreme Court allowed enforcement of the ban — lifting lower court rulings that had exempted certain family members of people in the U.S. — as lawsuits continued to play out in lower courts. The administration has said restricting citizens from several mostly Muslim countries is necessary for national security. But opponents have argued the ban discriminates against people based on their nation of origin or religion. One of the most vocal critics of the travel ban has been former Hawaii Attorney General Douglas Chin, currently the state’s lieutenant governor, who has fought the order in various courts. Chin was born and raised in Seattle, the son of Chinese immigrants. After graduating from Stanford, he got a job in the Aloha State in 1989, and earned a law degree at the University of Hawaii. He was appointed attorney general in 2015. Last December, he announced that challenging Trump on immigration and other issues, had prompted him to run for Congress, his first attempt at running for elected office. Chin believes Hawaii’s values can serve as a good example for everyone around the country. Chin is looking forward to hearing the arguments on the travel ban at the Supreme Court. Along with the state of Hawaii, plaintiffs include the Muslim Association of Hawaii, the mosque’s Iman, and two others. Looking back, Chin said the values he learned from his law professor, Eric Yamamoto, still resonate with him today. “He always talked about the importance of standing up for what’s right, and doing so even when there’s opposition and adversity,” Chin recalled. 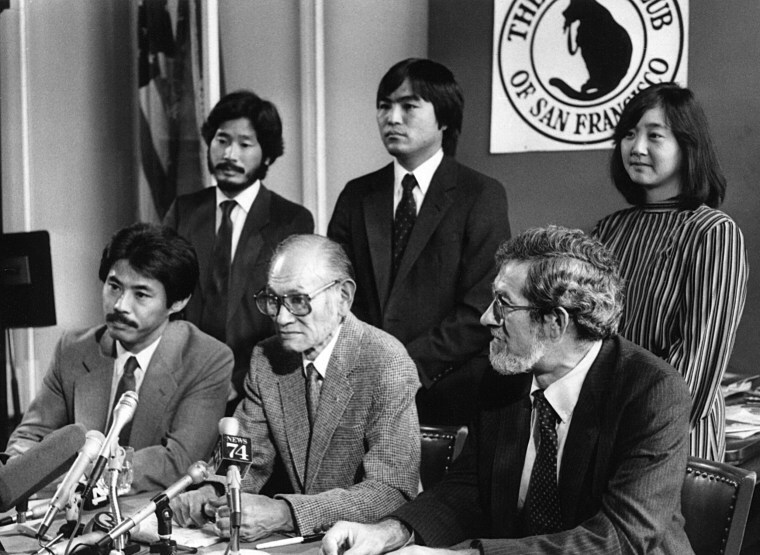 In the ‘80s, Yamamoto was on the legal team that reopened the landmark 1944 case Korematsu v. United States, the Supreme Court case that had upheld the mass removal of all West Coast Japanese Americans leading to their prolonged incarceration. In the later case, Korematsu asked for a "writ of coram nobis," which would vacate his conviction on the grounds of government misconduct. The legal team argued that the U.S. government had falsely manufactured its claim of "pressing public necessity," Yamamoto said, deliberately concealing high level intelligence that proved that Japanese Americans had not committed any acts of treason to justify the mass incarceration. The federal court in 1984 affirmed a Congressional Commission's finding that there was no military necessity to imprison approximately 120,000 people of Japanese ancestry, most of them American citizens. Judge Marilyn Hall Patel overturned Korematsu's conviction for resisting the military orders, clearing the name of all incarcerated Japanese Americans. Two other Japanese Americans, Gordon Hirabayashi and Minoru Yasui, also successfully reopened their 1940s cases. All three men were later awarded the Presidential Medal of Freedom. Yamamoto — currently the Fred T. Korematsu Professor of Law and Social Justice at the University of Hawaii Law School — released a book this month addressing the importance of judicial independence in security-civil liberty controversies, including the current travel ban case. The book, "In the Shadow of Korematsu: Democratic Liberties and National Security," examines "how the Supreme Court during World War Two took a very passive, highly deferential role in refusing to carefully scrutinize the World War Two government’s claim that national security justified the mass incarceration of 120,000 innocent, mostly American citizens, on account of their race,” Yamamoto said. “And by excessively deferring to the government’s claim of necessity, the court allowed the government in the Korematsu case to fabricate and even lie about the national security basis for the mass round up of innocent people without charges or trial,” he added. Yamamoto thinks that when the government responds to popular pressure and fears about a vulnerable group for apparently political reasons, rather than real national security reasons, that presents a danger both to targeted communities and American society. “When fundamental liberties are being restricted by the government’s actions, it is essential for the courts to undertake careful scrutiny of the government’s claims of necessity so that the judiciary acts as an independent arbiter in both promoting security and protecting democratic liberties," Yamamoto said. Trump’s travel ban has inspired the coram nobis legal teams who represented Korematsu, Hirabayashi, and Yasui to reunite for the first time since 1983. “We were upset about the travel ban because it echoes what happened in the Korematsu case,” said Don Tamaki, who was on the Korematsu legal team, noting that the federal government declined to release a Department of Homeland Security report in lower court proceedings. Tamaki and his group have launched an educational campaign called “Stop Repeating History” to help provide a better understanding of what happened in the past, and what’s going on now, to ensure that those in power do not abuse civil rights. The campaign has hosted speeches, panels, and screenings of the film “And Then They Came for Us” featuring actor George Takei across the U.S.
Dale Minami, who was the lead attorney in the Korematsu case, has also been speaking at events around the country and has written commentaries for various newspapers. “Asian-Pacific Americans remember the first immigration bans imposed on an ethnic group – the Chinese Exclusion Act of 1882, the Exclusion Act barring Japanese Americans in 1924 and the racial profiling of Japanese Americans during World War II which accepted group rather than individual guilt,” Minami wrote in the Contra Costa Lawyer. “President Trump’s justification of ‘national security’ for the ban on immigration from majority Muslim countries is eerily similar to the justification of ‘military necessity’ proffered in times past,” he continued. Minami feels it’s important for everyone to understand what’s at stake here. We were upset about the travel ban because it echoes what happened in the Korematsu case. The children of the three Japanese-American incarceration resisters — Karen Korematsu, Jay Hirabayashi and Holly Yasui — are also part of the Stop Repeating History campaign. They have filed another amicus brief to challenge the travel ban. The Fred T. Korematsu Center for Law and Equality filed the brief in partnership with the coram nobis teams. Akin Gump Strauss Hauer & Feld LLP provided pro bono counsel. Chin, the Hawaii lieutenant governor, said hearing Karen Korematsu speak in Honolulu last year, encouraged him to keep fighting the travel ban when he was serving as attorney general. “For me, as an Asian American, it really inspired me to say, ‘I don’t want to be that silent person, I don’t want to be that person who is not speaking up about an injustice,’” he said.